View our latest video on the left. Hear Paul Evans, Managing Director at Findlay-Evans Waterproofing explain advantages of Using Liquid Applied Membranes. ​Registered Building Practitioner & Certified Waterproofer. How Long Will Waterproofing Membrane Last? This is showing an inferior product which has been laid on here. It's full of holes and you can hear this when I do this. See here the whole membrane has lifted. It's not adhered. This is not Liquid Rubber. This is Wetsuit this material. Could be due to poor preparation. Could be a layer of grime and dirt underneath there. Something along those lines. You can see in here, it's a cold tar base and the other side of the membrane is filthy. So the preparation is lacking. Hello this is Paul Evans, Findlay-Evans waterproofing. Got a case scenario here that I would like to talk about. It's a commercial balcony on a hotel in the city. This balcony has been an extension on to an existing concrete structure. So the extension in the past that has been built is made of timber. something to be looked at. They used the chipboard flooring on the timber joist over, and then poured discrete concrete screed on top of that and then proceeded to tile it with the crazy paving slay. of the chipboard material is severe and dangerous. which is a compressed fibrous cement sheeting tongue-and-groove scenario for those who don't uninitiated. Once that was all installed we went about basically waterproofing it from there up. junctions and penetration points and drain we installed two new drain points. We had our plumber come in and do that for us and connect that up to the storm water system to alleviate the water shedding. amount of waterproofing material on it. The waterproofing completed we then proceeded to install our Arma-Blue protection sheet which all membranes need to be protected with. We installed that and then had the grass installed over the top of that so that isolates the grass from the the membrane itself so when people are walking on that and you get the abrasion scenario it doesn't affect the membrane. The internal repairs we carried out as well we've replaced the ceilings and the cornices and then we also repainted as well the whole section. This got the kitchen up and running pretty quickly rather than waiting on a bunch of other trades to sort of get involved. Our team do as a one-stop shop scenario and handled the whole thing as a turnkey operation. There's a lot of little bits and pieces that we carried out as well just to finish the job off and turn it to be a wonderful job. Thanks for listening this is Paul from Findlay-Evans Waterproofing if you care to give us a call on 8812 2918. Thank you. I am Paul Evans from Findlay-Evans Waterproofing. This is a video just to show an overall aspect of health care facilities in Victoria. We've been working on a number of them now so we thought we'd just showcase a few of them. around and a set up a method of waterproofing it in stages so we wouldn't expose a whole area all at once and potentially causing ingress of water into critical areas such as operating theaters and also power plant rooms. came up with a very pleasing aesthetic as well as combating the waterproofing. on it originally. So on the stairwells we actually kept that intact and then we did that over the existing system. This was favored only because of cost and also for time so the system that we applied over the top gives it an entire membrane in itself. original screed. Then did detailing work and prepared everything for our system to go on. Once our system was on, a top coat was put down over the top to give it a bit of durability. This was all tested and made sure everything was all good. The clients and staff were extremely happy with the end result with no water ingress during the process of doing the works. Findlay-Evans Waterproofing. Call us in Melbourne on 8812 2918. Or the website again is www.waterproofingfew.com.au. Bye for now. Hello Paul Evans here from Findlay-Evans waterproofing. Back again, we got another story on a prominent landmark accommodation in Portsea. We were asked to come here and restore a balcony that was leaking badly on one of the apartments. man labor hours as well. We got it back down to the original slab and then set about re-screeding it with quick set screed. Given that we were doing this in June/July period, we had the weather against us. And in this case we had a two part primer to go first to combat the moisture in the screed and the slab. Once that was down and cured. Then we went on and applied our Liquid Rubber membrane with a fiber glass inter layer to give it more durability. Once we had multiple coats of Liquid Rubber, we put a Mocha coat and put down brand new imported pavers. Installed by our expert team of pavers with infinite detail. Once we got all that set up, we cleaned the job up completely and reinstated everything back to normal. At the end of the day we ended up having a very satisfactory result with the customer being very happy. If you want to know any more details please give us a call on 03 8812 2918. Hello this is Paul, Findlay-Evans Waterproofing. Just here today to show you another job that we've recently completed. This job is a commercial building with a number of different balconies. This job was approximately 8 years old when the tiles started lifting and erupting of the surface. There's great amount of calcification coming through the joints in the tiles. So there was great evidence that there were problems below. The original membrane was laid on the flat surface of the slab, then the screed was applied over the top of the membrane. There's a shot here showing inspection of the original membrane below. The screed above it proved to be in reasonable order. Some parts were a bit lousy so we had to fix that but those were only small areas. So we retained the original screed in this case and the membrane under was working as a secondary barrier. We screeded up areas that were low and had poor drainage to the outlet points. Those outlets needed some extra plumbing works done. So we installed new puddle flanges to make sure the water control was being directed down the pipes. Once in place we moved ahead putting a new membrane. This was carefully detailed specifically in certain areas. Then we went ahead and laid our Liquid Rubber membrane introducing an inter-layer of fiberglass mesh to give it some toughness. That was then over coated with Thermo top Coat giving it a bit more robustness and durability. Then balconies were tiled while our team kept on working with the tilers to finish off the job. This job had many facets of water ingress areas which we fixed. This has been an extension on to an existing concrete structure. So the extension in the past that has been built is made of timber. Thanks for listening this is Paul from Findlay-Evans Waterproofing if you care to give us a call you want to discuss course on 8812 2918. Thank you. ​Hi, this is Paul Evans, Findlay-Evans Waterproofing. We're here to do a case scenario about the Doncaster Police Station. We were working with Rob Morgan who's a prominent rectification builder at Morgan Constructions. He asked us to go into the Doncaster Police Station. We removed all the pavers and stockpiled them for reuse, which were sat on concrete pads which we call cow pads. So we basically removed all those pads. Then we cleaned up, detailed and rectified all the main issues with the old membrane system. There was an old PVC membrane system which had shrunk back from all drainage points allowing water to migrate down beside the drains instead of going down in them that was the main problem with this one. Once all all cleaned up, we applied our Liquid Rubber system with fiberglass inter-layer to beef up the membrane system. We detailed everything quite thoroughly to make sure it was nice an tidy, and water tight. The air-conditioner system had to be rolled out of the way with the use of help of air conditioning experts. We moved that out on rollers as you would in the Egyptian days. Then we re-installed the pavers on buzz-on stands which were put on pieces of Arma-Blue which is our protection sheet to isolate it from the membrane system. These buzz-on stands can be screwed up and down to get the heights of the pavers correct. Once we had all the pavers in position, we decided to cap the planter box which was also a suspect for leaking, as they didn't want to use the planter box anymore. We did this by framing it up and implying his inkling sheet over the top of it and capping everything off around the bottom of the floor wall junctions. We installed a flashing just to make it neat and look nice. There was a gap of some 30-40mm which didn't look particularly attractive so we flashed it all off just to make it look like nothing to do if waterproofing but just purely for aesthetics. Hello, it's Paul Evans, Findlay-Evans Waterproofing. Here we have another case scenario to share with you. It's a below ground basement that was built for an engineer and wanted to make sure everything was hunky-dory. So, we basically went to great lengths whilst having to deal with some bad weather. Luckily Liquid Rubber can go on a slightly damp surface. It will take a bit longer to cure but it can be done. There was a lot of hand detailing there, particularly the cold joint at the bottom. We basically did all the detailing one day and came back another day to spray. Once the membrane was cured, we installed Arma-Blue Protection Sheet to protect the Liquid Rubber Membrane and to form a secondary semi-waterproof layer. This was quite a difficult job in terms of access which was quite confined which you can see. The client was happy with the results. Hello, this is Paul Evans, Findlay-Evans Waterproofing. This is a small case study on a cloaking job we did. We call this cloaking because we spray Liquid Rubber onto a polyethylene fabric which is being draped up the back of the wall. In this case we're spraying with our Liquid Rubber and a special twin head spray gun applicator unit. This is all detailed by hand and then sprayed. In this case a brick wall was laid in front so the cloaking was behind this to prevent water from migrating in behind the retaining wall. It goes to show we can spray even directly on clay surface. Sometimes we do that with peer and beam jobs. Thanks for listening. I often get asked the question, "What are the different types of waterproofing membranes, what is the best waterproof coatings to fix water leaks for roof, my balcony, basement, retaining walls. There are three basic membranes on the market. There's a lot more but those three that sort of come out more commonly. Torch On Membranes – these are Sheet Membrane which is commonly welded with heat torches. Bituminous Sheet Membranes commonly bonded with an adhesive. Liquid Applied Membranes – spray apply or brush & trowel application. Liquid Rubber is an Elastomeric, Seamless & Flexible One Coat Spray On Waterproof System for Roof, Balcony, Retaining Walls & Basements. Some of the advantages of using liquid membranes are numerous but to try and short circuit it, they're flexible. This is a major part of it. They move and rake with the building. They are able to be applied in to areas which other sheet type membranes can't be. They can be terminated and bonded to the surface that you're putting them on to. Sheet membranes don't always allow that to happen. It's not really a competition between sheet and liquid, but I'm trying to give some of the advantages of using liquid, which is why we do use liquid membranes. Liquid membranes also are quite quick when need be. If the weather conditions allow, we can do about a 1000m2 in a day, which is pretty substantial coverage. We're in, we're out. We get the job done, and it's curing out pretty quickly with our instant set material. The bonding side of it is critical as far as waterproof membranes. Often other types of membranes will de-bond over a period. Then once they de-bond and start to leak, you can end up with a waterbed type effect. The water leak might be some many meters away from where it actually comes in to the building, which is a crucial part of it. Everybody might look for a leak at point A but it's actually coming out at point B. Whereas liquid membranes, are fully bonded to the surface. If there's a leak, if someone does puncture there membrane somehow, the leak will be where the puncture is. You can easily rectify it and repair it in a flash. That's a very, very good way to go about using liquid membranes. The footings of the basement and retaining walls are critical. It's usually the "live" joint as we term it. That's the joint between the slab or the footing and then the wall is in place on top of that. This is usually where a leak will occur if it's going to leak. Particular attention is paid by all our applicators. FEW methodology is to get down on that by hands and knees basically and get right in to that joint with brush on material. This is then applied thoroughly in to that joint to make sure that that joint will not leak. Even if you don't put another membrane on it that joint will not leak. This is important. What we do is we get right down, get it coated, get two or three coats on there, and prepare it up. If it's a nice clean junction, we'll actually use a polyethylene fabric on that as a reinforcement barrier as well that's embedded in to the liquid rubber. Then once that's done, the overall membrane is applied over the top. Effectively on that joint, you patch over about five or six coats of membranes. You can understand it's a very substantial part of the job and a very substantial coating that goes on it in retrospectively. After that's done, the coatings are on and they're all cured, we then use a protection sheet to protect that beautiful work that's all just being done. The protection sheet that we use is a sticky back material, which means it's a peel and stick. You rip the backing of it, stick it on the membrane so that it doesn't shift and move about when the excavators are coming back in to backfill those areas. This is critical because otherwise, vines, stones, and things can get down the back of conventional type protection sheets that will cause an amazing amount of damage to the membrane. This will puncture the membrane and start to leak. Quite often, I'm being faced with builders who think they know what they're doing. They'll put the protection sheet in, backfill with scoria or crushed rock, and so on. Then after it sets out, it's leaking. Why? Once it's dug out, we understand why because you pull the protection sheet out. It's full of stones and everything behind, lots of little holes in that membrane that's all going on there. It's not just our membrane, this is other membranes as well. It's critical to protect the membrane, very often overlooked. The practices for doing retaining walls and basements are critical. In these areas, they're going to be usually backfilled so that you get one shot at doing this and that's it. The preparation is paramount. The surfaces must be absolutely clean, preferably as dry as possible. Our material will take some minor amounts of moisture but generally they need to be bone dry. This is always a challenge because they're underground usually. Of course, with inclement weather, you have water coming in all the time. It needs to be carefully planned. Anybody in construction needs to prepare it properly and think about how they're going to do this. It's always disregarded and disrespected actually in the industry. The best way, simplest way is keep it clean. Keep it dry. Keep the surfaces smooth and as harmonious as possible so the membrane will bond to it and you don't have little holes and divets to fill up all the time. This is a paramount part of preparation, which is our meticulous way. All our applicators go about and are trained in this fashion. Waterproofing balconies can be quite tricky. They are often tiled, some aren't, but mostly they are. People will often ask us, "Paul, can we come in here and put a membrane over the top on those existing tiles?" Obviously, it's cheaper to do that because you don't have to remove the tiles and everything else that's underneath it. The danger here is that the substrate, being the tiles themselves, needs to be sound. It's critical that it's sound because if you are putting any sort of membrane over the top of loose and drummy tiles, drummy being they're not bonded correctly. If you tap underneath, you make a drumming sound. That's why it's called drumming. If you try to put a membrane over the top of that, there is a very, very good chance that it's going to come off. The tile will come away with the membrane. In doing so, it will tear the membrane. Even a highly flexible membrane can still be damaged by this sort of occurrences. We tend to recommend against putting membranes over the top of tiles. There are some minor, specific cases where we'll do it but only a few. Generally, the balcony should be stripped right back to zero, go right back to bare bones. That can be right up back to the actual structure, which if it's a very bad, has been leaking very badly over some years, this is the way to go because you can check the structure, and as certified builders, we can check actually do that. We can check the structure and make sure that it's not rutted out. There's been a number of balcony collapses in recent times and unfortunately some deaths. This is something that needs to be checked thoroughly. If there's damage, we'll replace that damage and as Registered Builders we can do that. Once that's done, we can rebuild the whole balcony from the ground up. We usually use more modern materials that are available on the market today, which is called a scyon board, and that's a really top notch base to work from. Once that's down, we then apply our membrane. We use reinforcing materials in our membrane to make sure that it's super strong. Then a screed will be applied over the top of that membrane to get the level so the water will run to the draining system, below the tiles, not on top of the tiles. This is a crucial part of tiling. The biggest misconception for tiled surfaces is that water runs off the top of the tiles and goes to drainage. It does that but that's not the critical part of it. It also loses its way through the grout lines because even a freshly grouted balcony will shed water first a period of time. Then the grout will shrink. It will get minor tiny cracks but water will seep in to those cracks, go down underneath the tile and hit the membrane, which is there. This is a crucial part of this formula because we put a membrane on the bottom. We put the screed down. Then we put a membrane over the top of that screed. Then the tiles are fixed to that membrane. This allows the water then to flow through the tiles. This is crucial and everybody needs to really pick up their ears. It does flow through the tiles. They might laugh and say, "Oh, now you need silicone. That will stop that." All the rest of it, it doesn't work. I guarantee you this. I’ve had over 35 years of experience, I've seen so many of these jobs with people and really well qualified builders stand there and talk word on the face, "Mate, it will not leak through the tiles," and I can tell you it does, all right? I’ll get to the point wherever I need to. This is the way I'm going to do it. The whole issue is that membrane underneath the tiles needs to be substantial membrane, of course. The water hitting that membrane needs to flow through the draining system. That might be puddle drains, strip drains, whatever it might be. It depends on the design. Once the water slowly, slowly works its way through to that drain, it will go away, of course. Now, while it's doing that, that membrane needs to be able to support water. When I say support, where I mean hold it up. I mean be able to coat with that water over a long period of time. Because as you can imagine, the time that water works its way through the grout lines, gets through the adhesive, and it does work its way through the adhesive. The adhesive needs to be the right adhesive so it can support that water. Again, it's got to be a submersible type adhesive. This will then allow the adhesive to remain intact and not re-emulsify, which I see many, many times, and that's the white stuff coming out through the grout lines. The extra adhesive breaks down with water. The water then moves its way through the membrane. It's sitting on that membrane for a very long time. If you grab a bucket of membrane or you look a lot of membranes off the shelf, you're going to label and say, "This is not for ponding water." This is a crucial part of waterproofing. Ponding water often destroys membranes. You might say, "It's a waterproofing membrane. How can it destroy it?" Well, it does. It's not designed to hold water. You must have a membrane that holds water. Liquid rubber holds water. It's designed for ponds, swimming pools, reservoirs and the like. It's designed to actually contain water. This is a major part of why we use this material. The water then slowly, slowly, works its way down to the drainage points. The membrane stays intact because it's suitable. The adhesive stays intact because it's suitable. Of course, the tiles are made of fortified clay, so that's not going to be destructed too readily. This is the waterproofing system, and it's crucial to waterproofing. Membranes will last in varying degrees. The average life span of most membranes is around 25 years to 30 years. The industry sort of dictates a 10-year warranty on everything. It seems to have locked in on everything. Yes, we offer a 10-year warranty. If we need to, we can offer 10 years, 15 years, 20 years or 25 years if we need to. That's sort of the going situation as far as our terminology for warranties if you like. But the reality of it is if you’re going to put a membrane down, you really want it to last. We use high quality materials, not the cheapest on the market I can tell you that, but they certainly are a high quality material. The reason we do that is we want them to last. As the consumer is using this product, again, at the end of the story, they don't really want to be calling us back in 10 years, 15 years to say, "The membrane's broken down. It doesn't work." Given that, the timing on it will vary depending on its use, of course. It's like putting that carpet in your home. If you just traipse over it and you bring the army through it every day, it's going to last a very short time. Isn’t it? If your old couple that use it every day now and then potter about your carpet, it's going to last forever pretty much. This is the same analogy it goes with membranes. It's a wearable surface like any other no matter what membrane goes down. It's subject to wearability. It's subject to how it's treated afterwards. They do get mashed about by other sub trades behind. For example, I'm not putting it down but the air-conditioning guys and people working on the roof, they tend to be a little bit rough, put the tool boxes down and gouge in to the membrane, throw down spanners, throw down hot materials, drills holes at a metal and the hot metal goes down, burns through the membranes. This is all membranes. It's not just ours. We see atrocities all day every day. I'm not going to tell you. It does wind us up. People should be more careful with membranes but if they are, they last for a very, very long time. Hello, this is Paul - Findlay-Evans Waterproofing, Liquid Rubber Melbourne. 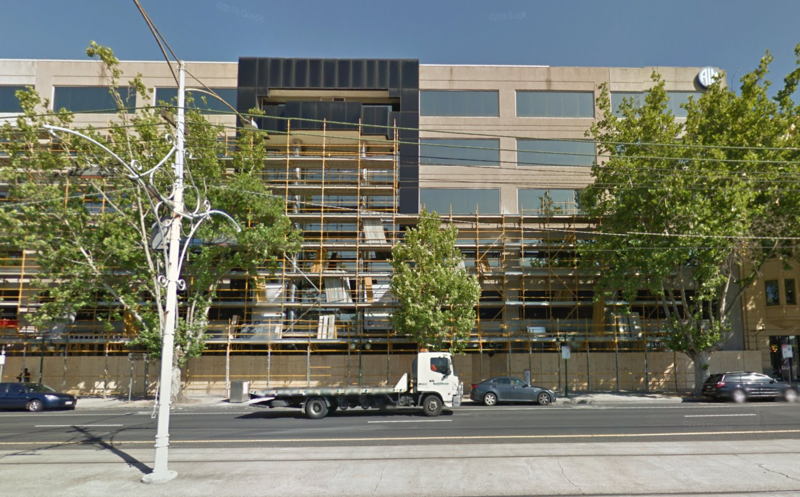 We've got a case study here on a roof top in Albert Street in East Melbourne. It's the CoInvest Building. We were asked to come in by a facilities manager to inspect the roof first of all to see if there's anything we can do about it. This roof has been leaking for many years and many have come and tried a remediation on it. There is a big underlying issue on this particular roof. Many people have come and put patches all over it to try and stop leaks intermittently. The leaks are basically being caused by in this particular case by a bitumen base that's been laid when the original building was built. The someone has come along and put an acrylic membrane on top of that. The gas builds up from the bitumen as soon as it heats up but blowing holes in the membrane and causing leaks. So we had a task ahead of us to get that one sorted. So what we had to do was to work our way through the various areas. As you can see it's an extremely busy roof with lots of equipment. We opened up some sections and found the bitumen was throughout the whole building which was naturally expected. Once we thoroughly cleaned the job, we went through meticulous preparation. Each and every up stand, joint, junction, post - everything had to be detailed at length. Then a reinforcing fabric was installed over the entire job and all the pop up stands as well just to make sure we had a good tough membrane. The areas where the bitumen had caused a lot of devastation down in the existing membrane we cut out completely. We treated them to a coat of our Thermo coat to isolate the bitumen. Then filled it with grout and floated it up. There were lots of low spots in the roof that was allowing water to pool. They were also floated up with screed and coated with our system. Once we had everything prepared with the fiberglass matting we then proceeded to put our Thermo Top Coat on. This went down in many layers and getting everything detailed up. Once we had it to a stage where we could work out where the out gassing was happening we out in many vents and the vents were delineated with the yellow colour - that and all trip hazards were all delineated with yellow so that there was no potential trips. The job was completed and the project manager came to inspect it and was delighted to see the end result and the job worked out to be really good. ​Hello, it's Paul Evans, Findlay-Evans Waterproofing & Liquid Rubber Melbourne. Just got a case study here we'd like to share with you. It's a very tricky industrial roof in the city. Actually on a historic building, a power station that provides power for a lot of the new high rise buildings that have been built up around it. We were asked to come in through another contractor. The builder in this case, who needed professional waterproofers and a specialized system to rectify a badly deteriorated roof, which was leaking into the power station. developed a system that would work and were very happy with the results. We'd just like to share that with you. In a nutshell what it pretty much is was five separate roof areas over the whole span of the building. Being an old Victorian building, various roofs were built up over time. So each roof had to be pretty much dealt with individually. We pretty much pumped up all the grout to the roof from the ground floor. A task in itself and then spread that across the entire surface filling up all the voids and cracks. Giving us a new surface to apply a specialized membrane. We let that dry out and then we started spraying our Liquid Rubber membrane over the top and built that up to a 1.5mm thickness. Specialist areas were treated with reinforcing mat. This one was sprayed with a dark grey rubber to help reflect the heat a little bit. It also became quite handy for the builders when they had multiple stairs joining into various levels. The job was very successful. The client was very happy with the results. Hello, this is Paul Evans, Findlay Evans Waterproofing Melbourne. Another case study. This is a large job in Somerton which is called Steel Mains. It's a large factory complex which is used for fabricating steel pipes. Inside the plant is a, or many, large vats which are at high temperature, and subsequent water leaks were causing big issues with these vats that can cause minor explosions. We were asked to come in and see if we could solve them problem. We did a wide remediation survey of the roof to try and find specific spots where it may be leaking. We found that is was right over all the entire roof which is causing issues. So the decision was made to spot fix the various areas around ventilators and so on that were causing major issues, and then we were the whole section of the roof. So we cleaned the whole job right down with power washing it, then detailed it all by hand. Detailing it entails laying down a polyethylene fabric and liquid rubber as a base. Once that's done we sprayed it with an etch coat primer which comes up as black in those images. Then once the edge coat was secured we proceeded to apply a top coat of our thermal top coat. Now this top coat, by coincidence, drops down the temperature inside the building by around eight to 10 degrees which is a huge saving for ventilation, air conditioning, if that's what's running. This particular case It's just really hot inside, so the guys were very thankful that this summer that at least they'll be having a lower temperature inside. It's quite a big area so there's lots of images. So weto do each section by section and work our way through it. It was a case of laying down one base coat of the top coat, then another following coat, and then the subsequent coat after that. So this ended up with three coats of top coat over the top of the etch to get a good membrane system over the whole thing. Results were very, very pleasing, management was extremely happy, they were very comfortable with the price that we quoted, and the work was carried out efficiently. So we came here to do that with honors, and if you have a roof with the same sort of situation please give us a call. We're happy to talk to you. You can contact us on Melbourne 88122918, and of course our website, you can always, www. waterproofingfew .com.au. Thanks for listening. Hello, this is Paul Evans from Findlay-Evans Waterproofing. Just another case scenario. Here we are dealing with a bottling plant, where the stainless steel tanks had some rust pit holes in them and were starting to get minor pinhole leaks. These tanks service hot water just under boiling point and also the water inside is being used for bottling, so it needs to be safe for human consumption. The water that comes out of these tanks and the material obviously we use is certified for potable water. Difficulty with this job was the tiny man hole for our applicator to get in and out. So, we had to have a spotter the whole time outside the tank just in case of some emergency might come up. Our applicator basically had to climb through the man hole and everything was fed to him. Whilst he worked, he had to come in and out quite a lot to have breaks working in that environment even though Liquid Rubber is non-toxic. It is safe and all the rest of it but just because it's a tight space he just needed to get out and take the respirator off. Even that was just a precaution. Once the tank was fully coated with Liquid Rubber, we then over coated using Thermo Top Coat so that it gave it a more durable surface for the just boiling water. The whole job went really well all in all and the clients were happy.